Recently I answered a question on StackOverflow, which may be an interesting, common case and understanding it correctly helps understanding subselects better. 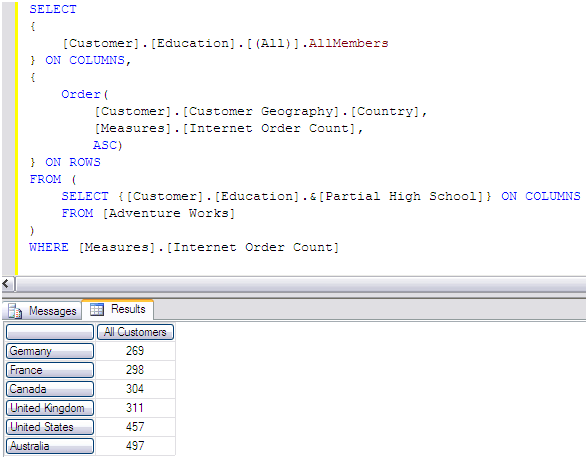 Here we effective place the All member of the Customer.Education hierarchy on columns, and an ordered set of the countries in the Customer dimension on rows. We have a subselect and a slicer. 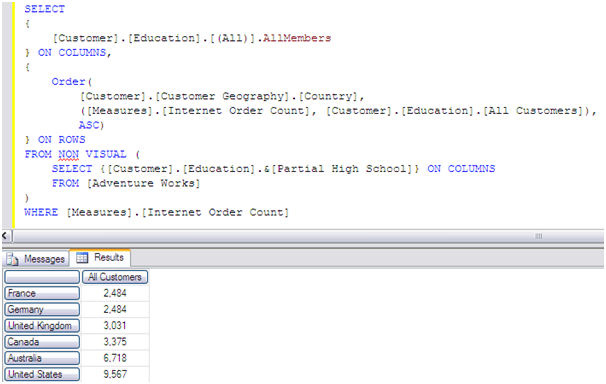 The slicer contains the Internet Order Count measure (which places is it in context) and the slicer restricts the query to look at customers with Partial High School education only. When we execute the query we get exactly what we expect. The difference here is the All member in the tuple used as a second argument of the Order function. What we get is a different order (note that Germany and France are on different positions on rows). It seems like the set is ordered by the total amount for all customers without taking their education in consideration – the subselect does not make a difference. 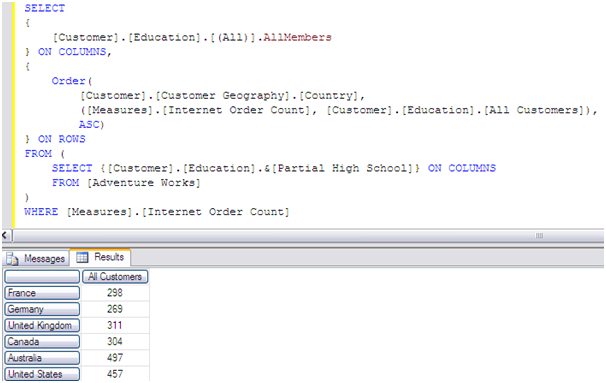 However, the measure value is the same as in the first query. So, what causes this? To answer, we need first to understand what a subselect does. As Mosha posted a while ago, a subselect (which is really the same as a subcube) does implicit exists with the sets or set expressions on each axis and also applies visual totals “even within expressions if there are no coordinate overwrites”. Instead of explaining the same as what Mosha has already spent the effort to explain, I will advise you to read this post thoroughly. Then, you would understand what the “implicit exists” does. In our case, it is not as important as the visual totals part, so I will concentrate on it. Therefore, the set of countries gets ordered by the Internet Order Count for All Customers without taking into account the subselect. However, the measure on the slicer axis still gets the visual total logic applied to it, and this causes the result set to be for those customers who have Partial High School education. We can see that the NON VISUAL keyword (SSMS can’t recognise this syntax and underlines with a red squiggly line) changes the way the measure is displayed. We see the total amount for the slicer, as well. 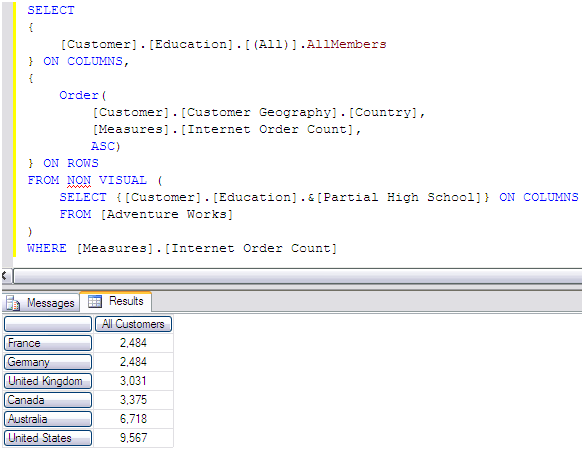 Here both visual totals are excluded and both the Order and the result set are done for customers with any education. Hopefully this will clarify the logic applied when we use subselects to some extent.